Peering down into Sonoma Valley from the Valley View Trail vista point. Hood Mountain marks the highest point on the Mayacamas Mountains between the Sonoma and Napa valleys at 2,733 feet. Area Indians call the mountain Wilikos, meaning Willows. The park's 1,750 acres features 19 miles of trails shared by hikers, bicyclists and horseback riders. It marks the largest trail system of all Sonoma regional parks. Taking along a trail map is advised. On numerous occasions we came across bare posts that appear to be intended as trail markers and may one day serve that purpose. For now, they serve merely to remind the hiker is indeed at an anonymous trail junction. The view from the top of Hood Mountain. Thick tree and brush cover makes finding a vista point difficult. From the southwest entrance to the park off of Pythian Road the trail immediately begins its ascent and almost never lets up. 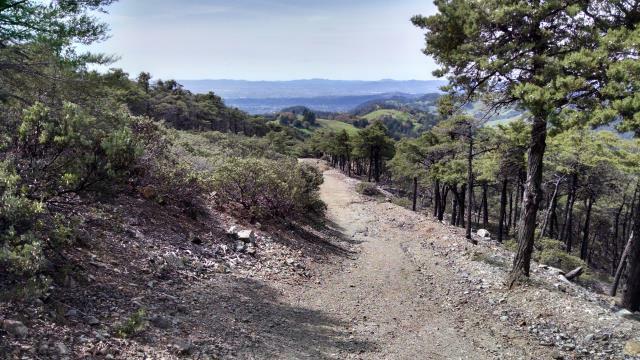 According to the official Hood Mountain web page on the Sonoma County Parks the trails are termed, "rugged". Aptly named we'd say. The trails here are challenging at times, perhaps some of the roughest in Sonoma Valley. Switchbacks cut through some of the steepness, but some segments, such as Hood Mountain Trail near the summit of Hood Mountain are straight shots that seem to rise almost vertically in front of a hiker. No hand holds are required but you'd not have to reach too far to touch the ground. The soil on the Panorama Ranch Trail is less nutrient rich, causing the trees growing here to be shorter then elsewhere in the park. The Lower Johnson Trail jumps onto and off of a paved road leading part way up the mountain. The path follows Hood Creek, which can be clearly heard and seldom seen. A portion of the Bay Area Ridge Trail runs through the park. Following this path to the peak will add some extra mileage and time to reach the top. 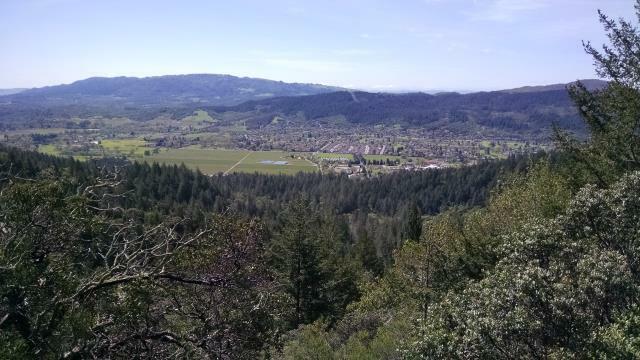 One is rewarded though with some impressive views of Sonoma Valley along the aptly named Valley View Trail. The peak of Sonoma Mountain on the other side of the valley can be seen here. For those wanting a great overlook over Sonoma Valley without the extra effort to get to the top of the mountain, this is your spot to hit. Coppertone and Austin Explorer at the overlook on the Panorama Ranch Trail overlooking the Azalea Creek Canyon. The summit at Hood Mountain can be a bit anti-climatic given the effort to reach it. A thick cocoon of trees and dense shrubs surrounds the peak, depriving hard working hikers of sweeping and breathtaking vistas. The hike up here was the breathtaking part. In actuality, if you look around the exposed area at the peak you can spot a smaller opening with a large rock sticking a few feet higher. If you climb to the top of that you'll be able to peer over the foliage blocking your view. It's not a 360 degree panorama, but it's beautiful nevertheless. Gunsight Rock Overlook, perhaps a quarter mile beyond the peak and a bit lower in elevation, promises better views given the lay of the land and plant cover. This spot is also accessible from the adjacent Sugarloaf Ridge State Park. Hood Mountain has a number of plant communities that call the steep slopes their home. One of the more interesting ones is the pygmy forest found along the Panorama Ranch Trail. The nutrient poor soil here results in stunted growth of some of the same species of tree that grow to double or more its size just a few hundred feet away. The more diminutive foliage also help to clear the sight lines for views into the Azalea Creek valley. It may not be Sonoma Valley, but here are some of the best views in the park. Coppertone and I made use of the "Sugar Shuttle" to do a one way hike through Hood Mountain Regional Park to Sugarloaf Ridge State Park. The temperature was quite a bit cooler than yesterday, so we thought we hit the jackpot. Surely, the fog would burn off as the Sun rose higher. It would, but would it burn off quickly enough? We started off at the Los Alamos Road trailhead where the Sugar Shuttle dropped us off and quickly worked our way down Hood Mountain Trail. Our pace was interrupted now and then by banana slugs. We had seen them before on other hikes, but the frequency in which we encountered them today was uncommon. What was really interesting is when we came upon one eating a sprig of moss. I had never seen a banana slug eat before. When we encountered addition slugs later we offered up some moss we found nearby. The water was flowing briskly in Santa Rosa Creekso the creek crossing was not as easy as it had been during our previous trips. The trail splits into two right before the creek with the trail leading into Sugarloaf Ridge to the left and continuing on to Hood Mountain to the right. We ended up going down the Sugarload fork, cross the creek and then hug the creek shore on the other side for the short distance until we could get back onto Hood Mountain Trail. From that point the trail steadily climbs towards the summit. Hood Mountain Trail is a jeep trail that presents a wide path for hikers, cyclists and horses. At the junction with Summit Trail we considered taking the hiking-only path to the summit but found the trail there a bit more overgrown that we would have liked. So we continued on the main trail that roughly parallels to the top. We did later join Summit Trail higher up when it intersected again and the trail there looked far more clear. The higher elevation helped thin some of the grass from Summit Trail, but so did the October 2017 fires. Parts of the trail looked like the scene of a post apocalyptic movie set. Blackened trees and brush stems reflected off an eery light. With that said, the evidence of recovery is abundant. Sprouts of new growth are popping out of the ground and even out of the trunks of trees many would have considered dead. As we encountered in our previous visit to Hood Mountain the last segments to the top are very steep and tiring. When we reached the summit we took some time out to have lunch try and check out the views, which were non-existent. The fog had not burned off. The view from the top of Hood Mountain was never as great as from Gunsight Rock Overlook, so we had hopes that the time spent eating would deliver us some clearer weather. We continue from the summit along Nattkemper Trail towards Gunsight Rock Overlook. The trail junction with the overlook spur was severly burned. The charred remains of the trail marker pointing to the spur was leaned up against and equally burned tree trunk. Miraculously, the overlook itself was not badly burned. We did not get a miracle today from the weather though. The fog, though thinning somewhat, was still too thick to provide a view over Sonoma Valley. We continue down Nattkemper Trail, hiking along paths we had never been before and discover it's charms. There's an interesting mixture of steep grasslands and forested groves. 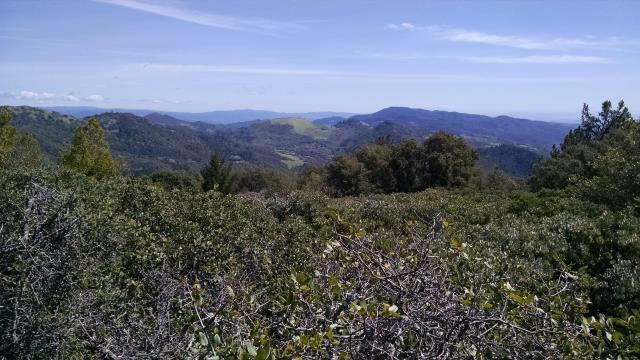 The grasslands open up to the west, providing views over Sonoma Valley. Yes, the fog is lifting and with every open vista to the west we can see farther and farther. Just a bit too late for us! We continue towards the boundary with Sugarloaf Ridge State Park where the trail turns into the Goodspeed Trail. There's extensive fire damage in sections here as well but an abundance and variety of wildflowers provide color to even the most burnt areas. We see a young lady passing by with a handful of picked wildflowers. Unfortunately this just means there are fewer flowers for other visitors to enjoy and fewer plants laying down seeds for next year's plants. Please enjoy the wildflowers where you see them! At a bit over 9 miles and lots of climbing (over 2,000 feet) we were fairly tired heading back to our parked car. But the Goodspeed Trail provided some interesting experiences, including a tree trunk bridge over a creek crossing made somewhat easier by the installation of a climbing rope handrail to help steady oneself. I think when we go back to get a view from Gunsight Rock Overlook without the fog I think we'll head out from Sugarloaf if we need to do an out and back. The distance to the overlook is a bit shorter and the elevation gain seems more consistant. But return we must. We can't let the fog get the best of us. Even starting out at the Pythian Road Trailhead the trail gets steep. This turned out to be a harbinger of things to come. We elected to take a series of trails up to the peak which represented the Bay Area Ridge Trail passing through the park. In hindsight this may have been shortsighted given the extra mileage it added onto the strenuous effort. Use a more direct route avoiding Valley View Trail if you're gunning for the summit alone. The Valley View Trail was not without its merits though. 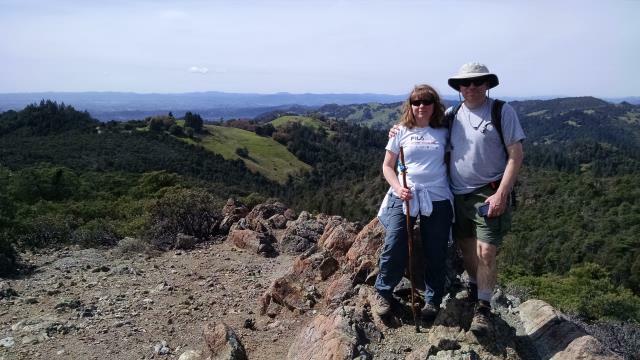 It provided some wildflowers and some of the best views of Sonoma Valley on the trails. And this includes the views from the top of Hood Mountain. Coppertone and I were not quite prepared for the steepness we encountered here as we made our way to the top of Hood Mountain. We knew there were switchbacks and elevation gain but were surprised to find a very steep grade awaiting us on the final pitch to the summit. We were tired. Once at the top of peak it was a bit disappointing to not have wide sweeping views of the terrain below. The problem is the peak is hemmed in by thick foliage. We found a rock outcropping just off the peak area that rose high enough to peak over the brush and catch a glimpse of what we'd accomplished. The views along Panorama Ranch Trail on the way down were also impressive. We stopped and exchanged camera duties with a couple and their dog so that we all were able to get in on the photos. A couple of girls from an area junior college were on the trail and could be heard yelling out their frustrations with school and homework. Hate to break it to ya girls, but the real world isn't all it's cracked up to be. Enjoy your time in school while you can. I suggest more hiking, and silence.